05-Oct-2000 -- I had an opportunity to attend a training seminar in Port St. Lucie, Fl. On the Friday before Columbus holiday. This seemed like a great chance to visit the majority of the confluences in the entire state of Florida. We packed up the motor home and left around 6:30 PM on Wed night. We normally go back roads but I wanted to get as close as I could to the first target so we hooked up on I-10 and headed East past Tallahassee where we took Exit 33 (Hwy 19) South. Could only make it to about Perry, Fl when the ol eyeballs gave out. We pulled into an abandoned parking lot a spent the night. Got up Thurs morning and calculated that we were only about 40 miles from the first target. We headed out and picked up Hwy 27. I have my GPS connected to the laptop and running Delorme Street Atlas 7.0. This really makes for getting close to the target a snap. The program shows a small gray road intersecting Hwy 27 that then intersects with Troy Springs Rd. At this point the target should be an easy walk. The gray road turns out to be a dirt road that will accommodate the motor home. When I arrive at the intersection I find that Troy Springs is a nice paved Rd. The target is about 400 feet into the woods from this location. There is a fence line with a cable stretched out across one section. 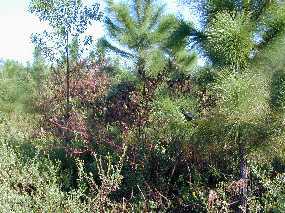 This is obviously a pine tree farm with rows and rows of saplings all about 8 feet tall and fairly thick under brush. I wind my way through and located the target without much difficulty. Right at the spot is a very beautiful deep red colored bush of some kind with big red berries. Now it's onto the next confluence for today.